One of the popular questions we answer about renting bikes on Maui is, "Does it cost less to rent a bike or should I ship my bike to Maui?" Renting a bike on Maui usually saves money, time and always avoids hassles associated with shipping a bike on an airline. Often, when customers return their bike rentals, they express being happy to have saved money renting a bicycle while appreciating extra to enjoy their vacation! Renting a bike on vacation avoids time needed to disassemble, package, and ship your bike before departing for Maui and the time to unpack and reassemble a bicycle after arrival. Renting a bike lets you ride longer because you won't need to repeat the process to ship your bike home after your bicycle vacation on Maui. Beyond time savings, renting a bike on Maui avoids typical high airline surcharge fees to ship a bike by air. We performed unscientific research to estimate the cost to ship a bike to Maui, including a container to ship your bike and the airline fees to ship a bike. Compare the total bike shipping costs to the cost of renting a bike on Maui. 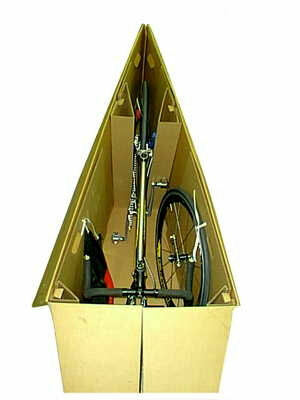 First, you'll need to get a container to ship your bike in, usually a cardboard bike box or a hard plastic rigid box. We found box prices between $34.95 for a standard bike shipping box to $99.95 for a heavy duty re-usuable bike shipping box. Add another $15. for the ground shipping of the bike box to mainland location. Bike box costs from shipbikes.com. as of 3/2/2011: Total max weight is 50 lbs. Max linear dimension is 115 inches. as of 3/2/2011: Total max weight is 50 pounds. as of 3/2/2011: Total max weight is 50 pounds. Max linear dimension is 115 inches. as of 3/2/2011: Total max weight is 70 pounds. as of 3/2/2011: total max weight is 50 lbs. A $130 fee will be charged if the combined dimensions are less than 80". Otherwise, a $390 fee will be charged. as of 3/2/2011: (1) 50 lb. suitcase and (1) AirCaddy for no additional charge. Billed by weight in combination with checked bags. as of 3/2/2011: Total max weight is 70 pounds. Advance cargo space reservation for your bicycle is required. as of 3/2/2011 - (1) 50 lb. suitcase and (1) bike carrier for no additional charge. After comparing the rates and reviewing all the regulations, restrictions and additional fees, are you ready to avoid the hassle and cost to ship a bike to Maui? Rent a bike on Maui from West Maui Cycles! If you do decide to ship your bike to Maui, we can receive the shipment of your bike and assemble. Your bike will be ready to ride when you arrive. NOTE: Advance reservation with confirmation is required for all bike shipments! Want to keep up with the latest information about cost to ship a bike to Maui and other Maui bicycle related news and information? Subscribe to our Maui Bicycle Blog!